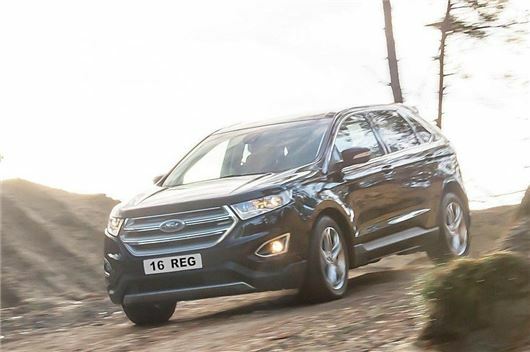 This is the brand new Ford Edge, which is available to order now from £29,995 and becomes the third and largest SUV in Ford showrooms. It's actually the second generation of the model; the first version didn’t go on sale here in the UK, but since its introduction in America in 2007 an insatiable appetite for SUV-type cars has become the pattern of the European market. As such Ford is confident that the Edge will prove popular as a cut price alternative to bigger premium SUVs like the Audi Q5 and BMW X3, offering more space but at a lower price. It has a more natural rival in the Nissan X-Trail though, the latest version of which moved away from ‘utilitarian 4x4’ territory and into the crossover sphere. Five versions are available, all of them four-wheel drive and the cheapest in Zetec specification, powered by a 2.0-litre TDCi diesel engine with 180PS and a manual gearbox. Titanium spec follows, available with either the same drivetrain or a 210PS version of the diesel mated to an automatic gearbox. That one costs £34,495. Sport trim is range-topping, and comes with either with the basic 180PS diesel and manual gearbox setup, or the 210PS and automatic, priced at £34,495 and £36,745 respectively. Interestingly both powertrains return the same 48.7mpg and 149g/km official consumption and CO2 figures. To put those prices into context, a basic Audi Q5 costs £32,130, while a 150PS diesel S line Plus version is £37,065. All Edge models are well-equipped, including DAB radio and Bluetooth, both controlled via a touchscreen media system, plus heated and cooled front seats, tinted windows, 19-inch alloy wheels and pedestrian protection. The full specification will be announced shortly by Ford, and it’s likely a top-end Edge Vignale will turn up in specialist Ford showrooms at some stage too, packing a £40,000-plus price tag. To reassure potential buyers that they’re not going to have another Volkswagen Phaeton on their hands, Ford has predicted impressive residual values for the Edge, ranging from 54.1 per cent to 56.6 per cent at three years/30,000 miles, varying by trim and engine. Although time will only tell if these predictions ring true. That should mean decent finance rates, ensuring that the Edge doesn’t become de facto more expensive than premium alternatives. In other words, if you're worried about losing money on this big new SUV, Ford wants you to know that the Edge is fine.